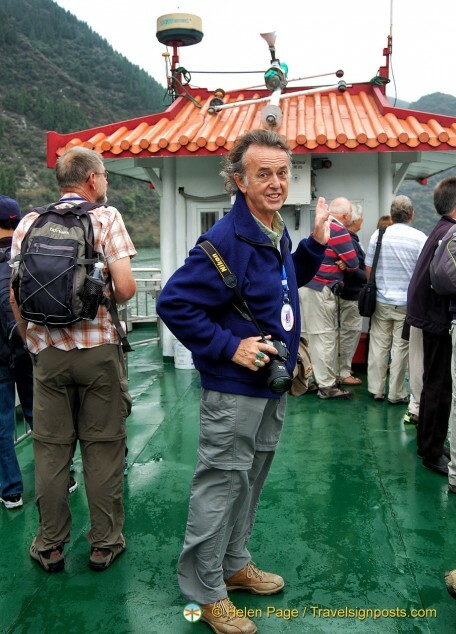 A popular excursion on any Yangtze River Cruise is trip up the Shennong Stream. The banks of the Shennong Stream have been the home of the Tujia minority group as far back as the Han Dynasty and the cruise offers stunning scenery and an interesting glimpse into the history and ancient culture of the Tujia people. Shennong Stream is a tributary of the Yangtze River and joins the Yangtze at the village of Xirankou. 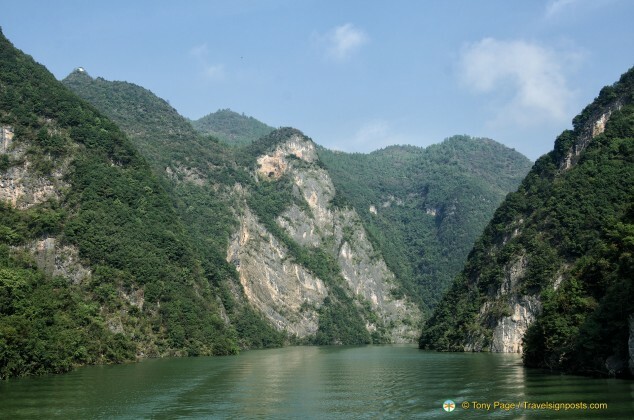 It has its source at the southern part of the Shennongjia Natural Reserve and it winds its way downstream for about 60 kms before spilling into the Yangtze. The Shennong Strem outlet is just opposite from the city of Badong where the huge and impressive Badong Bridge crosses the Yangtze River. 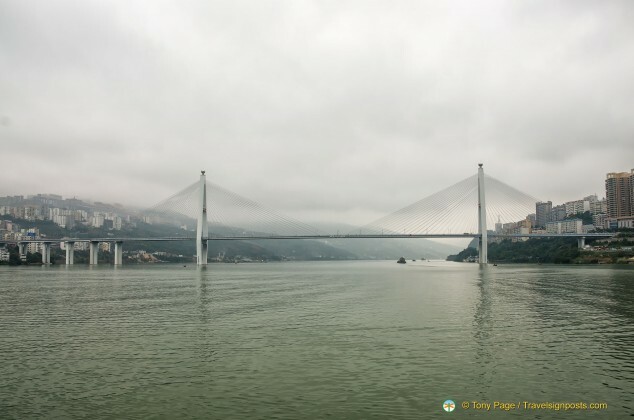 We arrive at the mouth of Shennong Stream early in the morning as all passengers on our Yangtze river boat, the MV Lianna, are required to leave the vessel at 8:15 am as the boat is having a wash down. For our excursion this morning we transfer to a smaller and more suitably-sized feeder boat to take us up the Shennong Stream. If you’re doing this cruise, it’s advisable to have a jumper or jacket with you as the boat is mostly uncovered in the upper deck and it’s quite cool in the morning. The town of Badong and its bridge are covered in haze, and as Badong is a coal mining town with a large cement factory, we naturally assume that it is pollution from the town’s industrial activities, but our guide insists that it’s the morning mist. 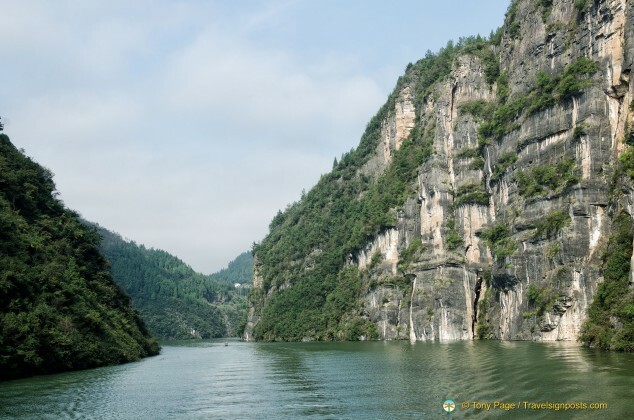 On our relaxing cruise up the tranquil Shennong Stream we go past rocky cliffs, thick vegetation and narrow gorges. Because of the hilly terrain in the area, the easiest transport is on the water and every now and then a wooden sampan drifts past us. These wooden boats, operated by Tujia boatmen, are sometimes called “pea pod” boats and they ferry passengers and goods along the stream. Shennong Stream flows through three gorges: the Longchang Gorge (closest to the mouth), the Parrot Gorge and the northern-most Shennong Gorge, which is the longest of the three. One of the interesting sights along the Shennong Stream are the hanging coffins. It took me a while before I spotted one, but those with better eyesight than mine saw them easily. If you take a good look at the crevices along the Stream, you’ll see them embedded high up in the crevice. 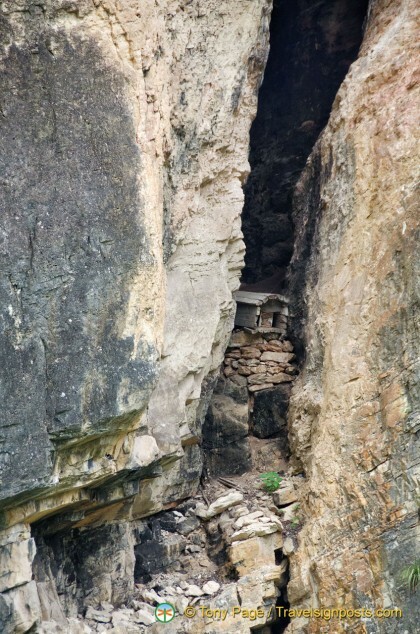 The hanging coffins are believed to belong to the ancient Ba people, who made the area their home and built ancient plank roads on the cliffs and the hanging coffins by hand. Given the rough terrain, you have to wonder how they manage to climb to such heights and to place their coffins in such difficult positions. The Tujia minority group are descendants of the Ba people. 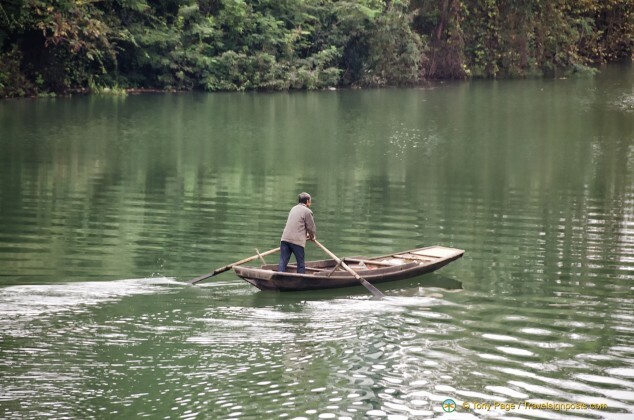 Another feature of the Shennong Stream is its boat tracker culture. On the Yangtze River Cruise, you’ll also come across literature or see documentaries about boat trackers. The old boat tracker tradition refers to the practice of towing the boat up cobbled streams where the water level is low and not navigable. 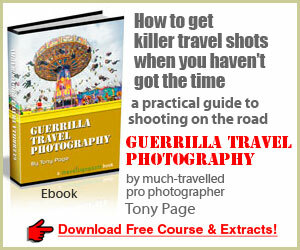 Boat trackers used to work in the Three Gorges area, but the practice is almost extinct now. However in the Shennong Stream the boat tracker culture still exists and provides a means of earning money from tourism. You can go on boat tours where the trackers tow the boat up shallow streams by holding the towropes over their shoulders. In the past, the trackers didn’t wear any clothing as the clothes became heavy in water and they believed that they wet clothing would more likely cause them to catch colds. 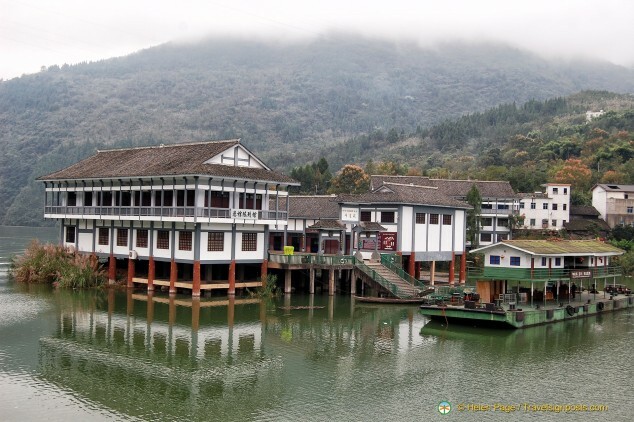 Our destination on the Shennong Stream cruise is the village of Louping where a short folklore show is put on for visitors. The Tujia people are known for their singing and their tradition of Baishou dance. In a large performance hall, their dance troops and singers perform Tujia ritual dances portraying farming, hunting, war, courtship and other aspects of traditional village life. The music blaring from speakers was exceptionally loud and the performers wore very modern and glittery adaptions of tribal costumes. For me, the show is disappointing as it is more like a modern variety show rather than traditional tribal dances. Beautiful young girls in short skirts and midriff tops, seductive as they look, hardly portray what village life is like during the rice harvest. For those not interested in the cultural show, there is a hall where you can buy souvenirs and jewelry, or you can enjoy the surrounding scenery from the courtyard of the cultural village. After the Louping cultural village we return to the MV Lianna for lunch and we set sail for the Wu Gorge. The Shennong Stream excursion is enjoyable and certainly worth doing. You can see more Shennong Stream photos Here.